One of the reasons I’m good with computers—and modest too, right?—is because I’m generally not afraid to play with a new program or feature. I learned a long time ago that it’s pretty hard to do something unrecoverable on a computer. So maybe you noticed in WordPress that you can now drag and drop photos into the Add Media box instead of clicking the Select Files button to retrieve them. I assumed this meant from Finder or Explorer, which it does. But then one day in a fit of laziness, I tried dragging a picture directly from iPhoto. It worked! Hot diggety. 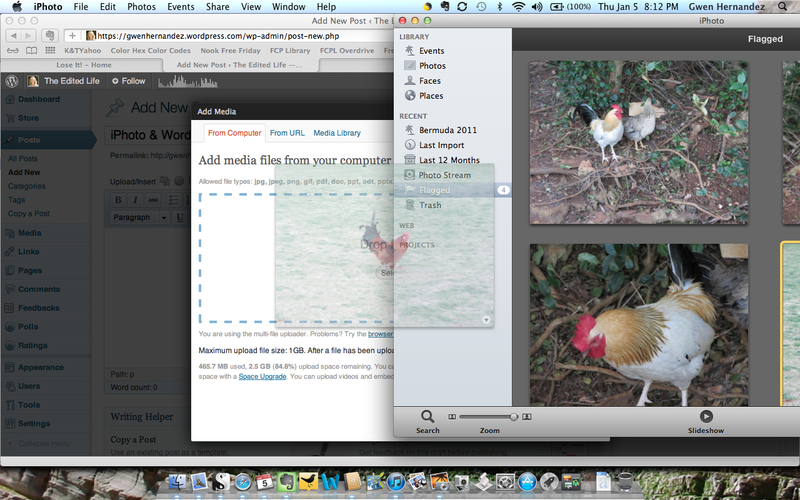 For example, what if I wanted to insert a photo of one of Bermuda's many chickens that roamed our resort? Here's what it would look like being dragged from iPhoto onto the WordPress Add Media window. 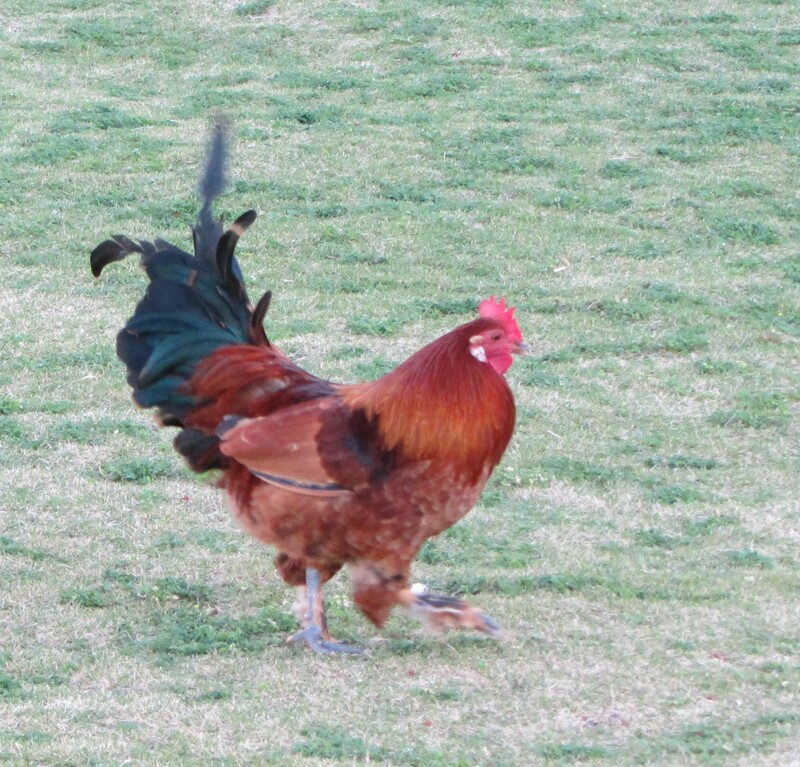 And there's the lovely rooster himself. Well, then I got to thinking as I’m wont to do. Would it work on an attachment in an email? Why yes, yes it would. What about a photo in an MS Word for Mac document? Um, no. But hey, it was worth a try. So, thanks to WordPress for giving us an easy way to add photos. Have you found any other programs that work with the drag-and-drop feature? UPDATE 1/12/12: You can also drag from the Show Downloads button on Safari (upper right corner, circle with down arrow button). Super handy for adding media downloaded from stock photo sites! I saw that WordPress had the new drag and drop, but I’ve been too lazy–Oh, make that busy–to check it out. Thanks for educatin’ me. Great post, as always, Gwen. Thanks, Sarah. There’s nothing wrong with being lazy! I think an inherent laziness led me to become a manufacturing engineer. Not because MEs are indolent, but because I was hate wasted time and motion and was always looking for the quickest, easiest way to get the job done. Thanks, this is very handy to know! Being lazy again, I just figured out that you can also drag from the Show Downloads button on Safari (upper right corner circle, with down arrow button). Super handy for adding media downloaded from stock photo sites! I was just googling for a plugin or app to do this LOL. Thank you for the post! Crisgzr: Sure thing. Glad it helped! The different screens on Mac were throwing me off, but I was able to drag the pic from iPhoto to the desktop, then from desktop to Word Press in a matter of seconds, so no loss. Thanks for posting this, my blogs just got so much easier! Oh good, helpmyhome. I’m glad you were able to figure out how to make it work for you! I still say that wordpress is a big enough platform that Apple would have added it to the “Share” button in its update. Hopefully that will come soon. Easier is definitely better. Thank you very much! It used to take too long to transfer my photos! Hi Gwen, your post has helped a lot but my images are so large, is there a way of reducing them in iPhoto before dragging into WordPress? bellebonanza: The only way I know of to resize in iPhoto is to go to File–>Export. This lets you either choose a custom size or just select Small, Medium, or Large. Unfortunately, this forces you to save the image outside of iPhoto. You could put it someplace like the Desktop, then drag from the Desktop to WordPress, then delete the resized photo when you’re done. If you already have the original photo outside of iPhoto, you could just open it (or better yet, a duplicate so you don’t mess with your original) in Preview and go to Tools–Adjust Size. Gwen, what about transferring media photos FROM my wordpress site TO my iPhotos! I have photos in media on wordpress site that I don’t have in my iPhotos for some reason. Although this is the least of my website problems, I am still very curious! Thanks! I signed up for your wonderful Scrivener classes on line but never got a chance to go through it-see any of it- but I have your book! Duh…. If you don’t mind working with one image at a time, you can click on the image in your post to open it in its own page, then right-click (Control+click) and choose Add Image to iPhoto Library.